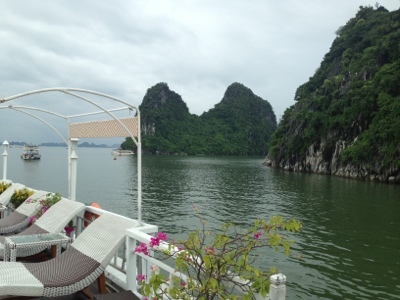 If your dream is eating copious quantities of Vietnamese food and laying on the beach all day, then we are living it! 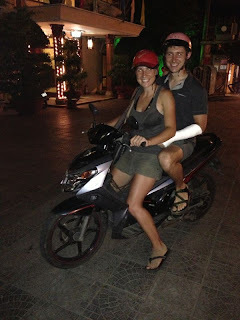 After Andy's medical mishap was handled, we set out to explore the little beach town of Hoi An, Vietnam. The "Old City" is very small, just a few blocks square, and full of shops and neon lights and the usual touristic silliness. 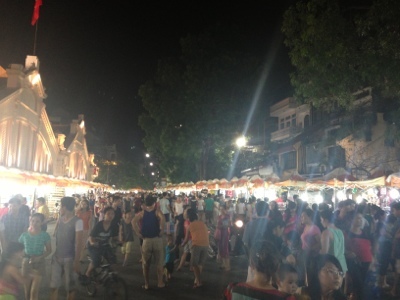 My finely-honed people watching-skills deduced that this is a tourist town for mainly Vietnamese (in addition to foreigners of course), so despite the trinkets and salespeople and paper lanterns everywhere, I feel like we're having an authentic experience. For dinner we had one of those perfect eating experiences -- when atmosphere and taste and view combine in the most satisfying way possible. We stopped at a street/riverside barbecue "restaurant," which really means a woman with a collection of pans and pots over a portable grill on the sidewalk. The proprietress waves passersby to sit down on a tiny chair at a tiny table (seriously, everything here is legit kindergarden-sized), and proceeds to serve amazingness. She handed us a menu and strongly recommended Pork Pau Lau and Barbecue -- ok sounds good! Pau Lau might be my new favorite thing: it's a bowl of think rice noodles in sauce (not fried) with slices of pork and a few crispy pieces of pork rind, all on top of a mix of greens, bean sprouts, and fresh herbs (cilantro and mint). I love greens mixed with hot things, and the fresh herbs here are fantastic and abundant. The barbecue is slices of deliciously marinated pork (I'm guessing something like sesame oil, vinegar, soy sauce, and sugar) pinched between chopsticks that have been split in half lengthwise. Perfect. 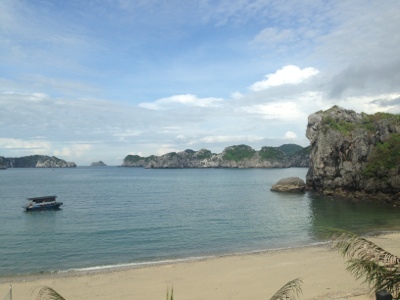 The next two days we spent at An Bang Beach, and that was pretty perfect too. 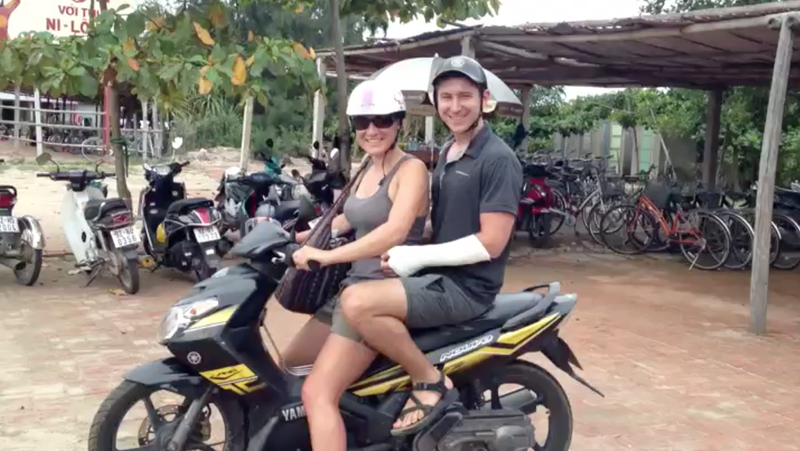 To get there we rented a motorbike, since a bicycle and broken wrist do well mix. As the one member of the party with four functioning limbs, I was the pilot of this operation, to the extreme amusement of everyone we passed along the way. 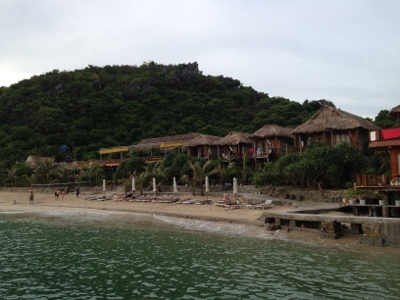 An Bang Beach is just 6k from Hoi An, is less crowded than the main beach, and I highly recommend it! At the beach, the lounge chairs are free as long as you buy lunch at the associated beachside seafood restaurant, WHICH YOU SHOULD DEFINITELY DO IT -- WAS MY FAVORITE MEAL SO FAR. After a rough morning of reading and swimming and beach walking and napping (refer back to the aforementioned "dream"), we sat down for a late lunch. I ordered the Squid Soup: rice noodles, shredded carrots and possibly green papaya, many many pieces of squid, all submerged in the most delicious seafood broth I have ever experienced. It was amazing and I will dream about that soup forever. The two days we spent there included more motorbiking, a lot more food, and extensive beach time of course. I could have stayed for a week (or more? ), but it's time to move on to the mountains! Well now this is a little bit inconvenient. Accidents happen, often in the most ridiculous ways. 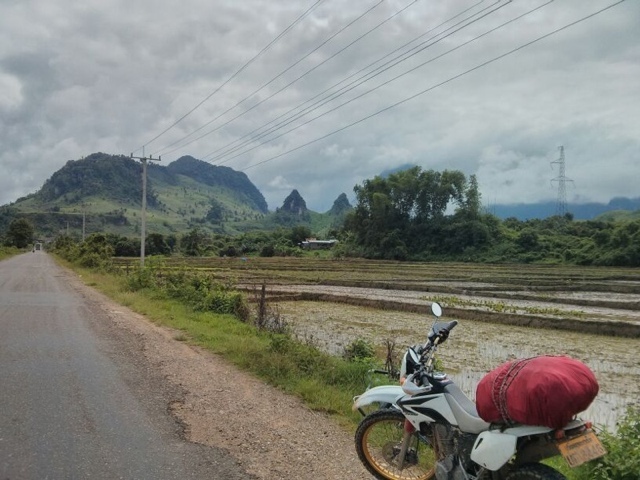 We've survived a week of dirt biking through Laos, a mini-bus ride packed with 27 people in an 11-passenger vehicle, exploring a region rife with unexploded ordinances, cycling around monkey-infested ruins, and white water kayaking through Class 3 rapids. So what's the one thing that results in a hospital trip? A morning run. 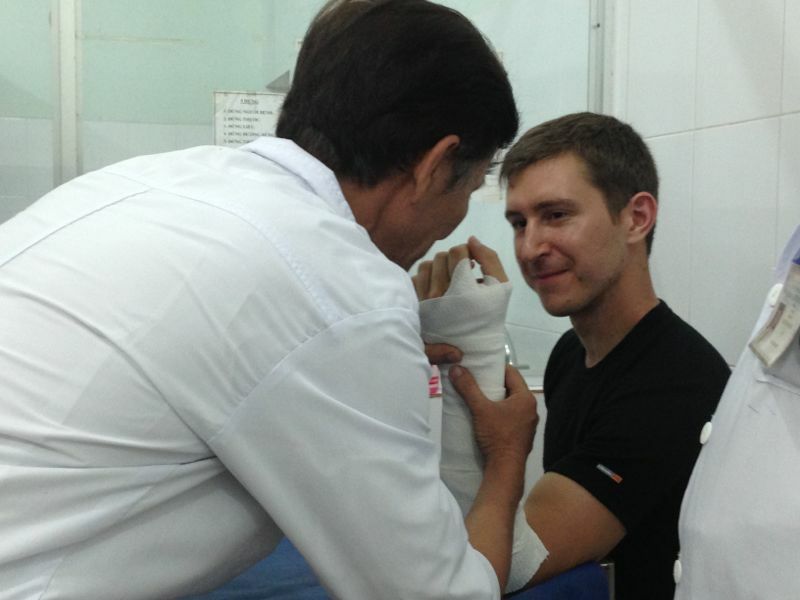 We ran first in Bangkok, a huge mistake from which I don't know if our lungs will ever fully recover. 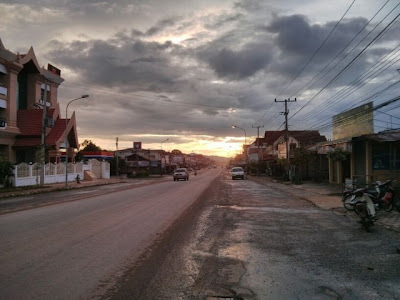 After that we made a rule of not running in pollution, so our next venture was along the Mekong river in Kratie, Cambodia, and again in Phonsavanh and Luang Prabang to shake out the stiffness of dirt biking. We've actually been running a decent amount, excluding situations of major pollution, overcrowded cities, and our hectic travel schedule of course. I know that sounds like excuses-excuses, but it really is hard(/pretty much impossible) to exercise consistently when on the move! So I'll enjoy occasional Asian running while I'm here, and have all the time in the world to get back into actual shape when I go home. So anyway, fast-forward to a couple mornings ago in Hue. Andy and I went out for a humid jog (soft j) along the river greenway, and all was going fine. We were on the homestretch, looking forward to consuming gallons of water, many many tiny cups of Vietnamese coffee (someone introduce them to regular coffee mugs please! ), and breakfast. There was a 1-foot high chain across the path to prevent motorbikes from entering the park. (You see where this is going.) Andy went for the hurdle, caught his foot, and proceeded to faceplant onto the concrete. I gasped, Vietnamese people shrieked (the giant foreigner crashed! ), and Andy popped up like no big deal. 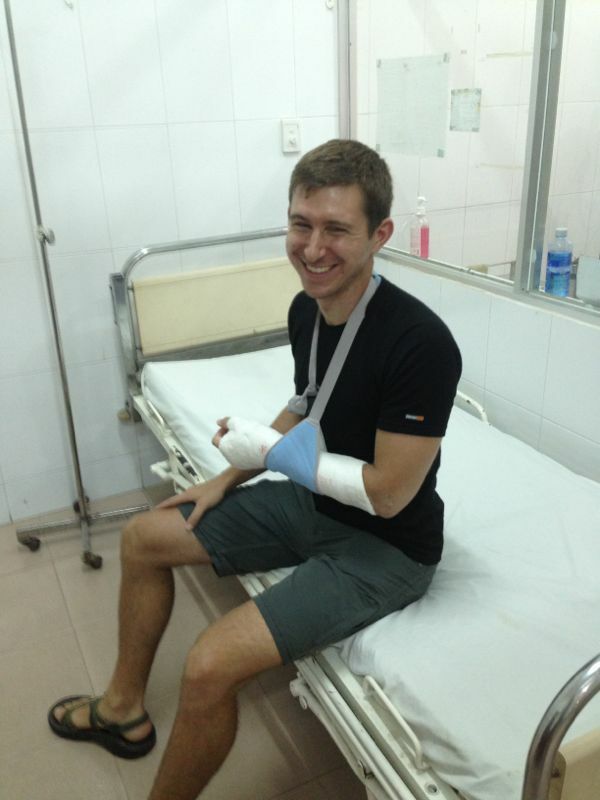 But later on, when we arrived in Hoi An, he decided an x-ray was in order. Yep, broken wrist. I'm happy to report that the Vietnamese hospital experience was excellently efficient and friendly, with some local charm. The doctor showed us the x-ray, pointed to the broken part, and laughed, "You are not so lucky!" But Andy is making the best of it, and considering that we're still traveling around Southeast Asia, doing whatever we want whenever we want every day, I don't think he's that unlucky. Oh yeah, guess who's driving the motorbike now? 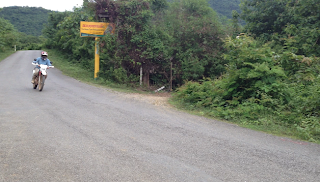 Well here we are in a private car, on our way from Hue to Hoi An (Vietnam). A private car! That sounds fancy! you might be thinking. And yes, yes it is. With a private car and a few million dong in my pocket (that's the Vietnamese currency, feel free to laugh), it looks like I'm taking steps up in the world and am well on my way to being a classy traveler! Or, more accurately, we waited until the last minute and the bus was full, the train was late, and this was the only way to get to where we needed to go. While we're talking about classy though, let me just take this moment to say that Southeast Asia is ALL so much nicer than expected. 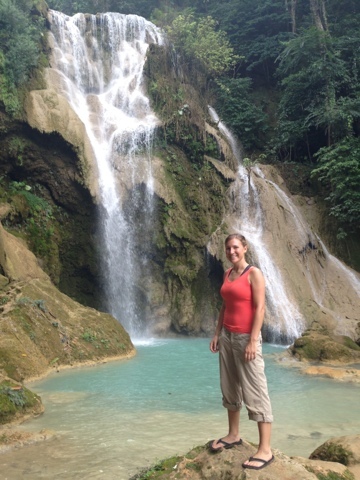 In Nepal, sister2 and I joked about what we called "the relativity of nice," as in that shower was really nice! And by that I mean it was full of spiders and dirt in all the corners but it had tiled floors and the water pressure was great! Or, that bathroom was nice, meaning it had hand soap and toilet paper woah crazy! But on this leg of the journey, at least in Andy's and my experience, things are legit nice, no relativity required! Hotels are clean, transportation is American standard, and the roads are good. 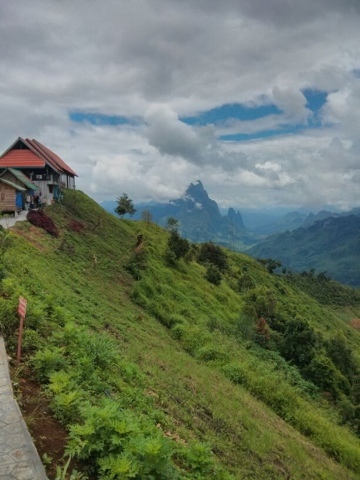 It is significantly more expensive than Nepal, but seriously, Agoda.com is my favorite thing for booking discount hotels -- if you travel you have to use it. Ok so anyways, it's been a while since I've blogged, so hmm let me catch you up. 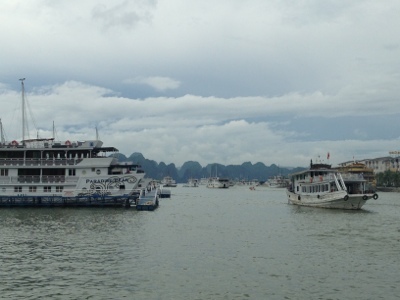 We finished our cruise and spent a day in Hanoi, which mainly meant walking 500 million miles (or so it felt) around the crowded craziness of narrow streets and many motorbikes and intermittent rain showers. 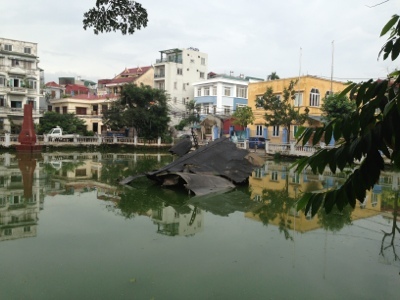 We found an American B52 that went down in a bombing raid during the war and is just kinda chilling in a pond in a neighborhood. 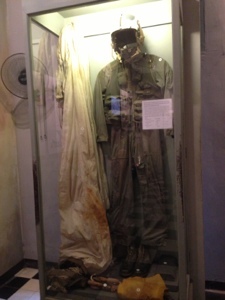 And then we walked past Ho Chi Minh's toomb. And then we went to the Hoa Lo Prison (aka "Hanoi Hilton"), which was built by the French to keep Vietnamese prisoners during colonialism, and later used for American POWs (including John McCain) during the Vietnam War. And oh don't worry we've been eating everything! Vietnamese food is amazing and so cheap. A full blog post about our gastronomic experiences is on its way! 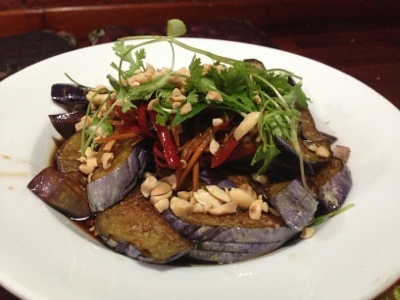 Grilled eggplant with peanuts, cilantro, and chilies. 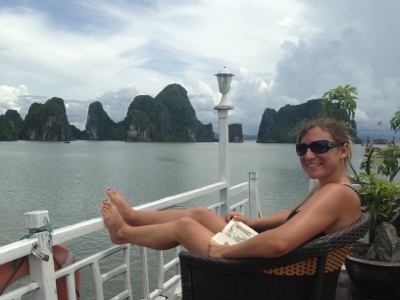 To get from Hanoi to Hue (the current capital to the ancient one), we did it Vietnamese style and took a sleeper train. I guess that counts as another instance of classy travel -- A/C! Individual soft berths! Space to walk around! It was more comfortable than a sleeper bus, though it did take a lot longer. 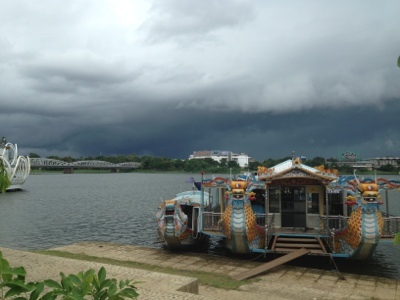 A dragon boat on the river in Hue. 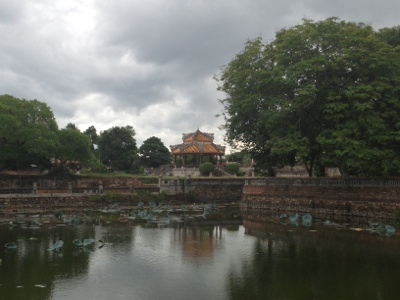 Hue (pronounced Huế) used to be the capitol of Vietnam, so we walked around the twice-moated citadel (is moated a word? You know what I mean) to see the ruins that are in the process if being rebuilt. 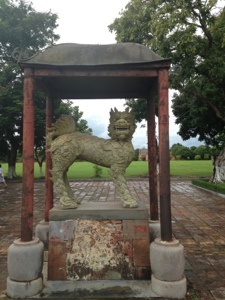 Because much if Southeast Asia had been sooo heavily bombed (especially Vietnam and Laos), a lot of the stuff we see us completely new -- towns, historical sites, etc, in the process of being reconstructed. Especially as Americans, it's hard to not think of the history here in Vietnam. So we might as well embrace it and learn some things! 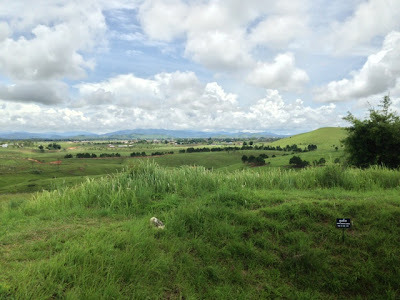 Thus, we spent day 2 of our Hue experience on a tour of the DMZ (the north/south border during the war). 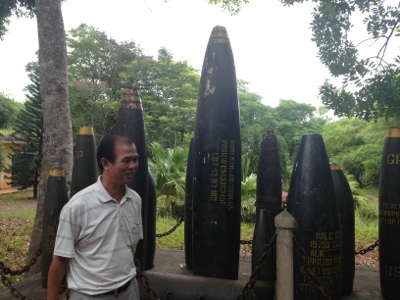 Our guide, Mr. Trung, is a former south Vietnamese soldier, so he really knew his history. The most interesting part was talking to him about what's happened since the war, how the north/south divide continues to exist, the current political climate, etc. Mr. Trung explaining an assortment of bombs. Our tour went to a church, a series of tunnels, the bridge across the border, and a former US base and now VietCong cemetery. Tunnel entrance. 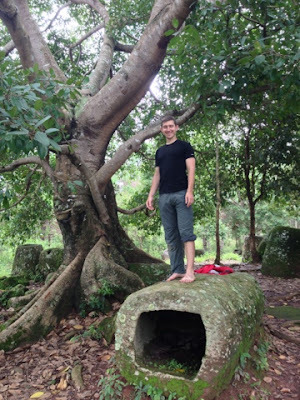 350 people lived underground for 5 years! Guided tours are not usually my jam at all (ugh people talking at me and telling me what to do), but in this situation it was good, and I think seeing the DMZ without a guide would be a waste of time. 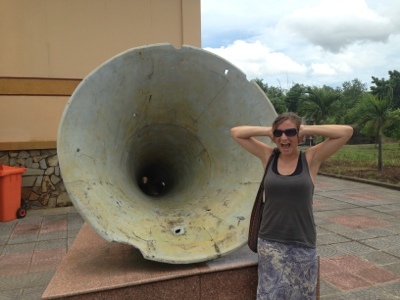 We've left the mountains behind -- goodbye Laos and on to Vietnam! 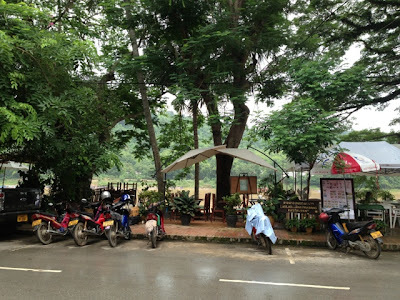 We arrived in Hanoi on Friday evening, and were immediately overwhelmed by the lights and noise and millions of swirling rushing zigging and zagging motorbikes in the narrow roads of the Old City. We spent a night just walking around, mouths agape at all of the things (so many things! 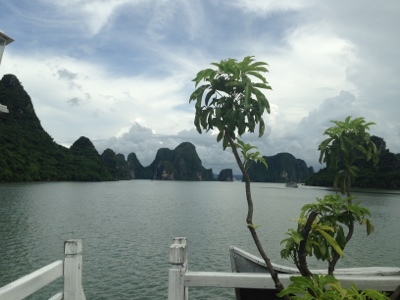 ), sampling Vietnamese food and desserts along the way. The next morning we were on our way again, this time changing things up completely and going for the must-see super-touristy experience: a 2-night/3-day cruise of Halong Bay. 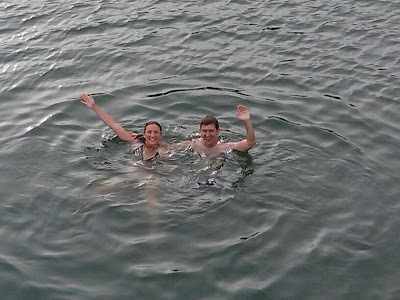 And so I'm happy to report, WE'RE ON A BOAT! 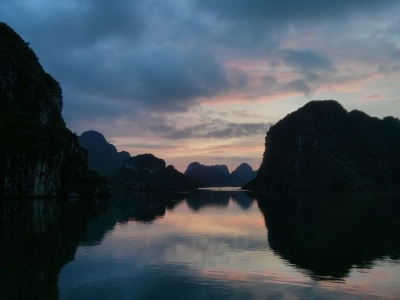 Halong Bay has 1,969 islands, some big, most tiny, all weirdly beautify like something out of Avatar or Pirates of the Caribbean or Jurassic Park. 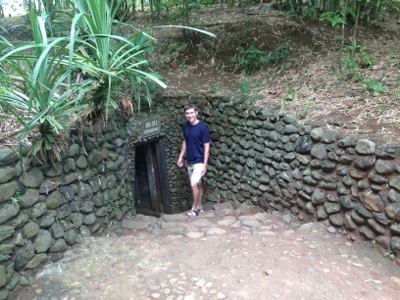 Our first stop was a huge cave on one of the islands. It was discovered by fishermen in 1993 and has since twice been named a "Natural Wonder if the World." The colored lights, paved path, crowds of tourists, and pleasant music over a loudspeaker made it all feel kind of like waiting in line for a ride at Disneyland, but the cave was so freaking cool that I didn't mind the kitschyness at all. 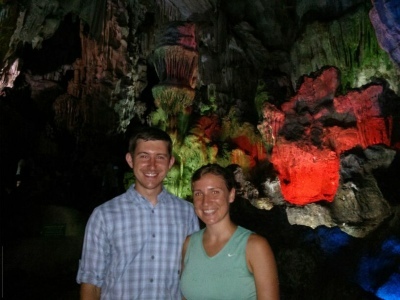 Plus the colored lights made the nooks and crannies and stalagmites and stalactites easy to see. Big, airy, and well-lit = my kind of caving! 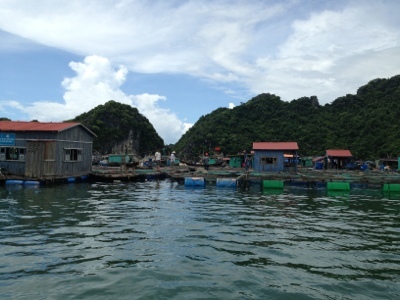 For our next activity, we went kayaking around a floating village, between some rock-tower-ish islands, and through waterway caves under the mountains. We only had 45 minutes, but the great thing about tandem kayaking with someone who is good at kayaking is that when Andy paddled harder, we moved so fast! Like four times faster than when I paddle on my own. We kayaked in and out of little coves, speculating on the best places to hide our hypothetical pirate ships, properly defend the bay from possible muarader invasion, and scoping out the very real awesome climbing routes up various rock faces. Oof look at those tan lines! Then we did it again to get it on video. I can't control the screaming, it just happens. There are 12 people in our cruise total -- four French medical students, a Spanish couple, a German couple, and an Irish couple. They're all nice, but kinda meh. I don't know if this is a cultural thing or just a bad luck thing, but they are not good at conversation. How do people just not ask questions? Don't they know that's how conversation works? So Andy and I are doing our own thing. I can't imagine being on a longer cruise and having to sit with strangers at every meal. My inner introvert can only handle so much. 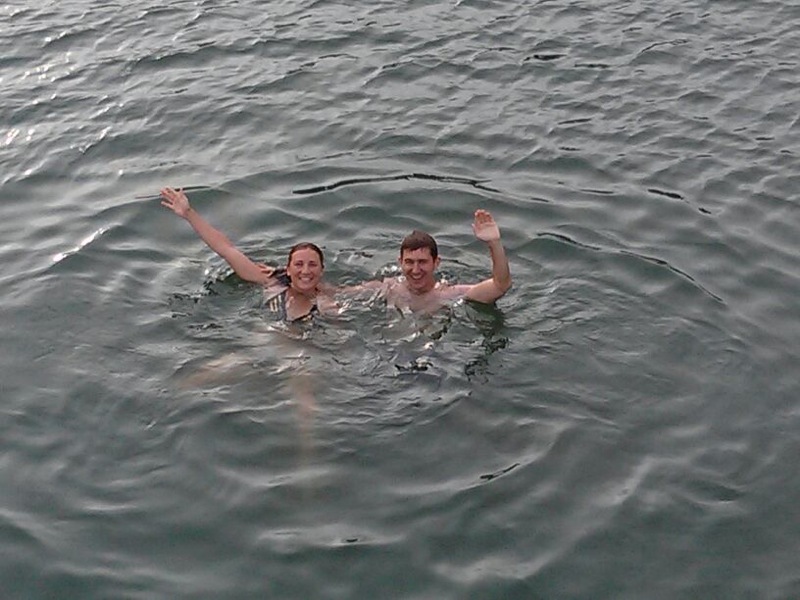 Sandy beach + warm water = hooray vacation! Day two of this experience is at a little beachside resort on Monkey Island. (Though there are no monkeys at the resort, a fact that I am happy about because monkeys and their grabby hands and old people-ish little faces kind of creep me out.) To get here, we left the cruise ship, then took a bus across a bigger island, then a small boat to the resort, arriving around lunchtime. I didn't take any pictures of the food, but it is delicious. Seafood me please all the time! My only complaint is that ummm slices watermelon is not and never will be dessert. Come on. 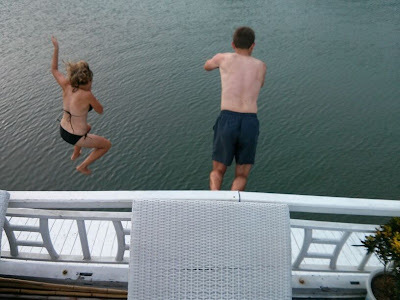 It's hot and humid, so bathing suits on and into the water STAT. It is the rainy season, so about every hour or so a storm cloud moved in, dropped some rain on us for a few minutes, then went on its way. I love a lightening storm on the beach! Our final morning was sunshiny and nice. We did the same trip in reverse (small boat -- bus -- cruise boat) and ended with lunch on the boat as we made out way back to the harbor. 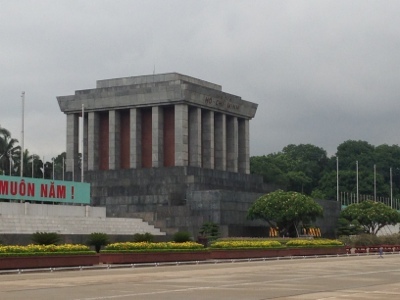 We'll be in Hanoi tonight, then who knows? Maybe on to more beaches! It’s the end of the week, and what a week it’s been! As you can see from Mollie’s posts (she’s traveling non-stop, with intermittent access to the interwebs, yet she still manages to write more frequently, and better, than I do) from Laos, she and Andy spent the week dirt biking through the Lao countryside. The beauty is indescribable, but I can’t for the life of me actually pronounce any of those places. Hooray Mollie and Andy! As for me, my brother came home today! After about 24 hours of travel (he lives really, really far away), he arrived to our local airport this morning. You know that this means? Time to make the pilgrimage to upstate NY to spend some quality time with the family! But that’s enough about me. It’s time for your Best of the Week! First, a word about running: Running isn’t always fun. In fact, sometimes it’s awful, especially when you first start. Marathon training? THE WORST. But that’s not stopping Mollie’s sister, Jeannie! She’s running the Napa Valley Marathon in March! And, in keeping with the family tradition (maybe it's genetic? ), she’s writing about it! Good luck Jeannie and Geoff! On to the Science & Technology section. There really isn’t a Science & Technology section here at Eat, Run, Read, but humor me. It’s Friday. First, 3-D printers and NASA! Let me repeat: 3-D printers! And NASA! It’s like the BBC wrote this article just to make me happy. NASA has announced it has successfully tested a 3D-printed rocket engine part. 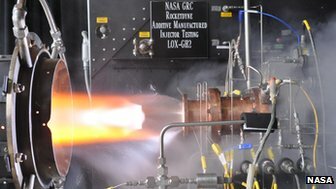 NASA said the component would normally have taken a year to make because of the exact measurements involved, but by using SLM [selective laser melting] the manufacturing time was cut to less than four months and the price reduced by more than 70%. Also better than a 3-d printed gun. Any of you who’ve ever biked into the wind know that biking into the wind is the worst! It’s like biking up a hill, but without the satisfaction of actually biking up a hill. And biking up a hill into the wind? Forget it. I’ll walk. 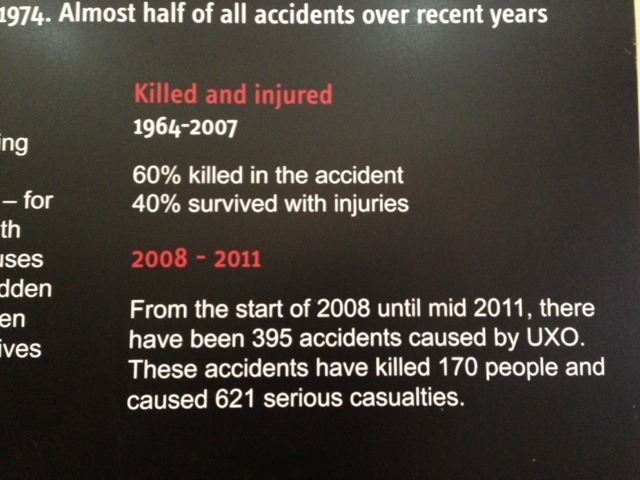 But riders in the Tour de France don’t have that option. So what do they do? They engineer themselves and their bikes to be as aero as possible. And here’s how. Following 14 years working in Formula One, he brought his biomechanical expertise to cycling and founded Smart Aero Technology - a company based in Brackley, an English town not far from Silverstone racing circuit, and one that lives and breathes motorsport. 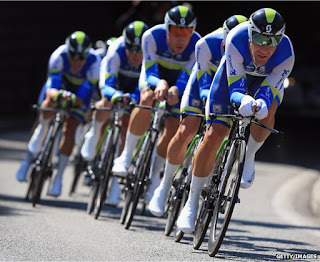 I think I saw these guys out on Hains Point last week. SLOW DOWN!! If you’ve ever wondered, perhaps on a particularly slow day at the office, how to build your own glacier, or what one would do with their very own glacier, here you go. Turns out glaciers can be very useful. Who’d have thought? Probably everyone. Chewang Norphel, a retired civil engineer who lives in the area, thinks he has the answer: if the natural glaciers have gone, why not build artificial ones? That is what, for the past decade or so, he has been doing. Moreover, he has built the new glaciers in places where they will thaw at exactly the right time, and debouch their contents directly onto farmers’ fields. If need another reason to get lace up and get out, turns out exercise may alter the way certain cells behave, specifically fat cells. In a paper published in the Public Library of Science, Dr Ling and her colleagues report the effects of six months of moderate exercise on 23 male couch-potatoes who were in their 30s and 40s. The men were supposed to attend three workouts a week. In the event, they managed an average of 1.8. Nevertheless, besides finding the usual effects—reduced heart rate, lowered blood pressure and a drop in cholesterol levels—the researchers also observed changes in the men’s adipose tissue, the place where fat is stored. Specifically, the way fat cells in this tissue expressed their genes had altered. Dr Ling, who is interested in adult-onset diabetes (often associated with too much body fat), knew that exercise stimulates epigenetic changes in muscle cells. These alter how muscle processes sugar. When she and her colleagues looked for similar alterations in their charges’ adipose tissue, they found lots—18,000 markers distributed across 7,663 genes. This matters, because adipose tissue is not just a passive store of energy, it is also an organ in its own right, producing a range of biologically active chemicals that have all manner of effects on the rest of the body. This sandwich is going straight to my guns! That’s it for today’s Science & Technology section. As always, hooray science! On to the Lifestyle section of this week’s Best of the Week. We don’t live in NYC, and there’s no way in hell I’d wait 9 hours in this heat (or any heat, for that matter), but this might be one of the neatest art installments I’ve ever seen. Since May 12, Mr. Guo and tens of thousands of others — art lovers, technology buffs and the merely curious — have trooped to the Museum of Modern Art for a chance to experience “Rain Room,” a temporary installation in which water rains down except where sensors detect people, giving visitors the illusion of walking between the drops. As many of you probably know, I love the city of Detroit. It’s not entirely clear why. I just do. And so it made me really, really sad to read this morning that Detroit filed for bankruptcy protection last night, especially because some folks are working really hard to make Detroit cool again. This guy is amazing! I mean it! 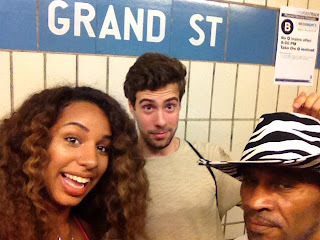 How long do you think it would take for you to travel to every subway station in Manhattan? College students James Doernberg and Kai Jordan found an answer to that question this past Wednesday, when they travelled to all 118 subway stations in Manhattan to take selfies. “The whole trip took 9 hours almost to the minute, and was quite a challenge, as we had to hop off the train, find a sign, take a photo, and get back on the train before the doors closed,” Doernberg told us. Where can I buy that hat? It’s hot out there. Like really hot. You know what the perfect solution to this ridiculous heat is? Ice cream. Lots of it. So if you’re in DC this weekend, let your tongue be your guide, and go on an ice cream tour. You’ll thank me on Monday! And so, with the heat index expected to hit 110 degrees today, ice cream is, without question, your BEST OF THE WEEK! I scream. You scream. We all scream WHY IS IT SO DAMN HOW OUT HERE??? Today was the perfect combination of running, delicious coffee, speed and adrenaline, exploration, and time in the sunshine. I am so happy! 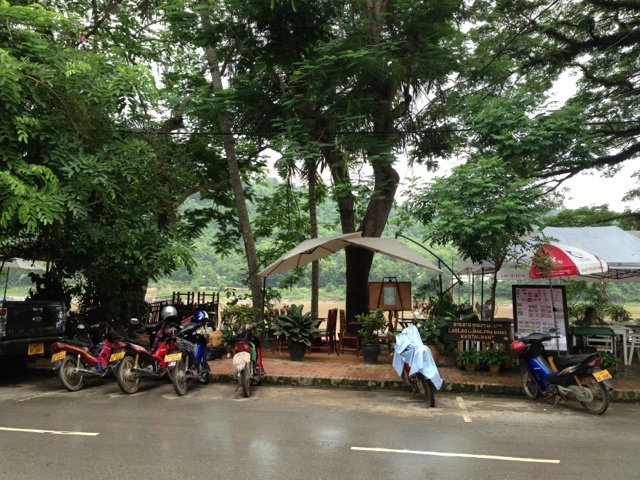 We arrived in Luang Prabang yesterday, a touristy but nice little city between the Mekong and Nam Khan rivers. 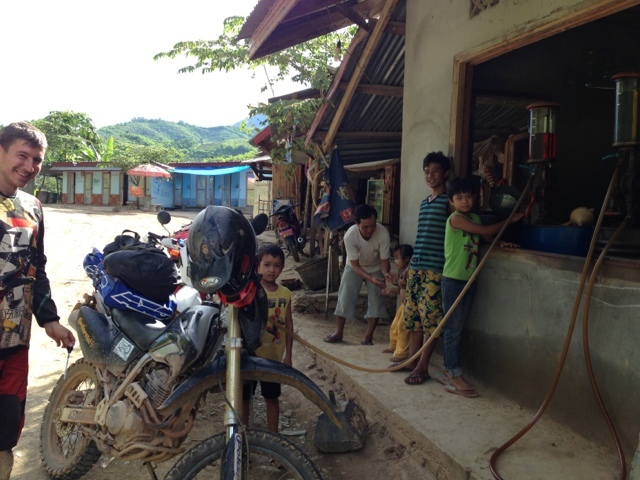 It was an 8-hour dirt biking experience to get here from Phonsavanh, but unlike other 8-hour transportation ventures, this was actually really fun! I woke up early this morning for a nice little run around town (my fourth run since leaving DC a month and a half ago -- let me tell you, I am so out of running shape!). The architecture here in the Old City is very French and very pretty. Riverside cafes line the road and sometimes it feels like I'm in Europe instead of Asia, which is strange, but nice. After breakfast on the river (Laotian coffee = swoon! ), we got on our bikes for Day 6, our final day of this dirt biking excursion. 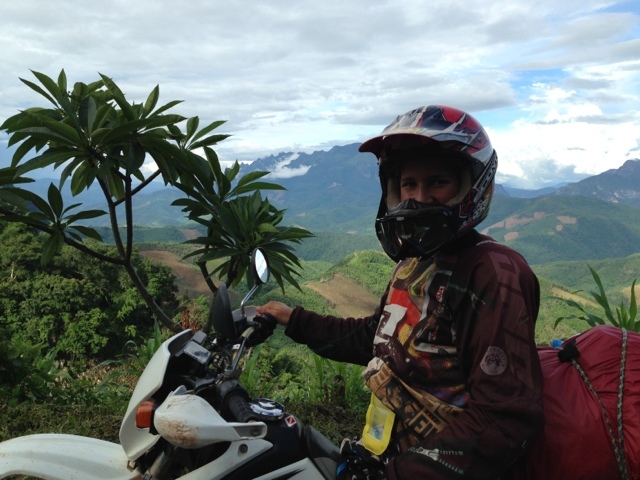 The 30k ride out to Kuang Si Falls was great! Curves in mountains are exciting, but scary because you constantly have to check your speed. Curves on flats (i.e. today's ride) are just fun because you get to go fast. 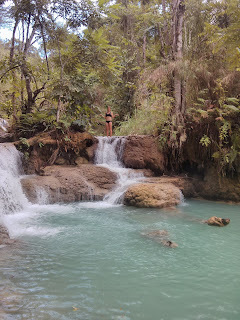 And the waterfalls, of course, were beautiful and refreshing. I don't think I'll ever get tired of exploring waterfalls, which is convenient considering they're all over Southeast Asia. 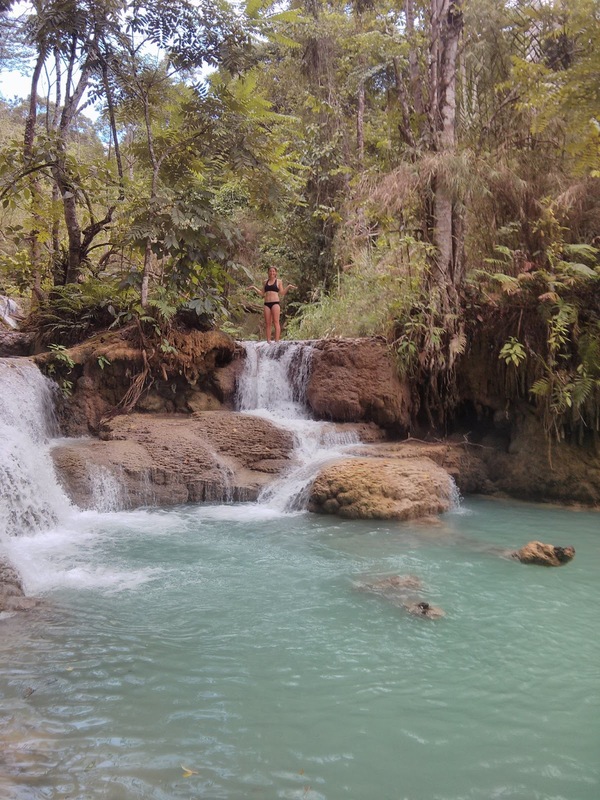 The limestone rocks make for super-turquoise water, and the multiple levels of falls are fun to climb up and jump off of (carefully!). Here we are in the weird little town of Phonsavanh, in Northern Laos. It looks like a cross between an old western movie and southeast Asia (dusty and full of cowboy-hat-wearing locals), nestled in Northern California-in-the-winter-looking-hills. We rolled in here yesterday afternoon after a loooooong day of dirt biking up and over multiple mountains. After seven-ish hours on the bike, I am getting really good and sharp steep curves, riding in the rain, waving at small village children, and avoiding meandering livestock. All important skills I'm sure, so we'll count that as a win. 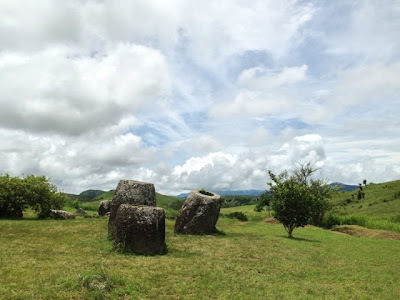 Phonsavanh is the capital of this province, and is kinda sorta a tourist destination (for those willing to work for it) because it is home to the Plain of Jars. Phonsavanh's other claim to fame is that from 1964-1973 it was one of the most heavily bombed regions of Laos, which is the most heavily bombed country in the world ever (we'll get to more details on that soon). The Plain of Jars is a series of sites of huge stone jars that were used for ancient burial practices from about 500 BC to 500 CE. So this morning after some delicious Lao coffee and waiting out a rain storm, we got back on our dirt bikes to see some jars! Site 1 is the most popular and accessible. We walked around the jars -- they really are huge! 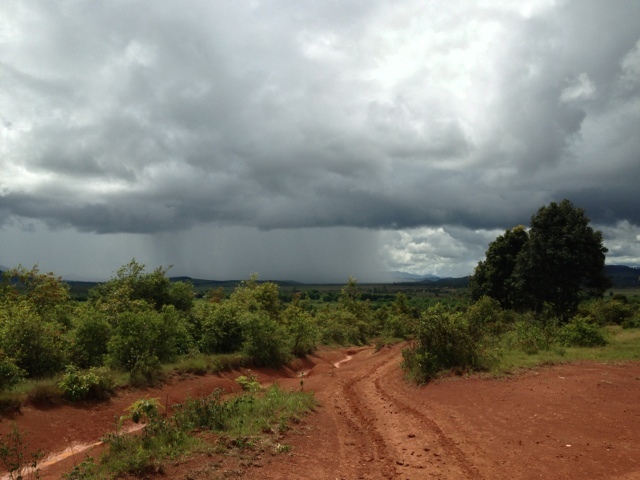 Then we rode to Site 2, which was quite the dirty experience, made more interesting (i.e. muddy) by the recent rains. While Site 1 had a cool cave, Site 2 had great climbing trees. And the jars were bigger and in better shape. and then the road kinda ended, so we decided to turn back and instead enjoy the mud on our bikes. Sadly I kept my camera/phone stowed away safe and dry, so no pictures exist, but we were covered in mud. 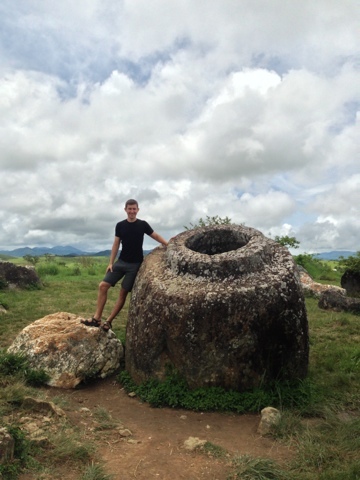 The jars themselves are cool, but what makes this place even more interesting (in my into-armed-conflict-prevention semi-morbid opinion), is that the Plain of Jars and much of the surrounding area is the site of major unexplored ordinances excavation work. So if you visit, stay on the marked paths! For serious. Since it's good to be informed about the places we go, in the afternoon, we visited the MAG (Mines Advisory Group) office to learn about their work. Then we watched a documentary about the US in Laos during the war. This is all FASCINATING to me. 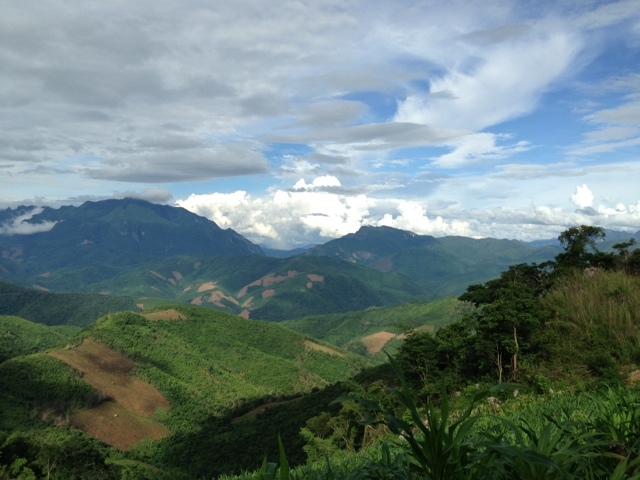 During the Vietnam War, the CIA was conducting a covert war in Laos (the largest CIA operation ever). 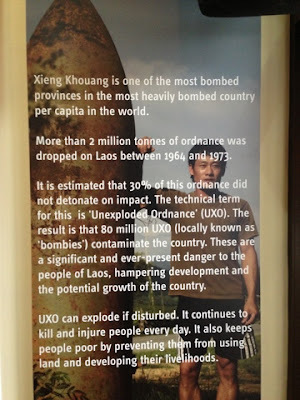 A US-backed (secretly of course) civil war destabilized the country (1953-1975), and in the largest air campaign ever, the US dropped a planeload of bombs on Laos every 8 minutes, 24/7, for 9 years, completely decimating the Plain of Jars (more info). So in addition to seeing large ancient jars, today we also saw bomb craters and trenches used by Pathet Lao and Lao Government troops. That sign says "Bomb Crater." MAG is a really cool organization -- they find and disable unexploded ordinances (which are still a major problem), work with affected communities, and train local woman to clear the bombs. Most of the UXOs are from cluster munitions, which are bombs that scatter small bombs ("bomblets") over a large area. Often the bomblets don't detonate on impact, and remain dangerous for years. The bomblets look like tennis balls and are usually detonated by people collecting scrap metal for money, or children playing, or farmers ploughing. Pretty interesting and important work! 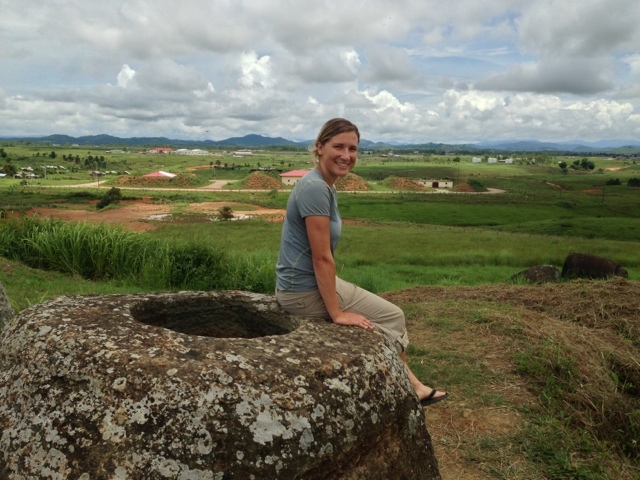 If you're interested in learning more about ending the use of cluster munitions, go here. 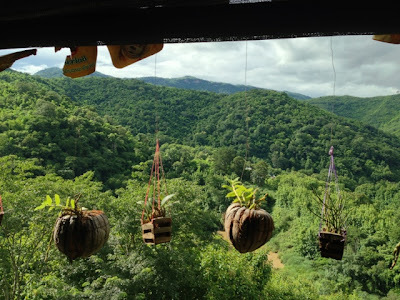 Beyond MAG and the Plain of Jars, there isn't much else in Phonsavanh, so our next stop in this beautiful country (that I hope will one day be cleared of UXOs...though that's unlikely), is Luang Prabang.